To Have a Constitutional Public Trial, Don't You Have to Let the Public in? Public access to the Bradley Manning court-martial doesn't exist in any meaningful sense, despite the demands of the U.S. Constitution or the Manual for Courts Martial United States (MCM) published by the U.S. Dept. of Defense, which is the prosecutor. 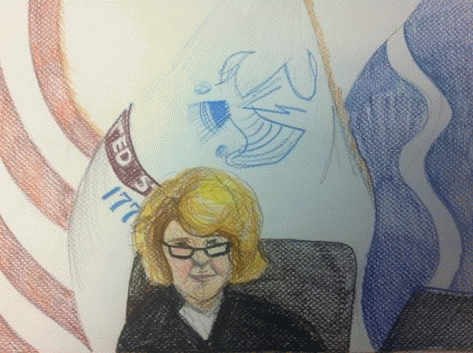 Court-martial judge Col. Denise Lind hasn't exactly banned the public -- or reporters, who are part of the public -- from the courtroom or its extensions, but she has presided over a system that, so far, seems designed to protect the public's right to know as little as possible. It's a scripted con game, a kind of judicial three-card monte in which the public is expected to keep believing it has a chance to know. The following excerpts from the script, the unofficial court transcript, illuminate how the military plays the shell game of doing injustice while trying not to let injustice be seen to be done.